Be the first to share your favorite memory, photo or story of Joli. This memorial page is dedicated for family, friends and future generations to celebrate the life of their loved one. 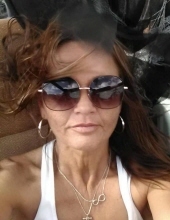 Funeral services for Joli Lynn Hensley-McMullen, 47 will be held at 11:00 o’clock a.m., Thursday, April 11, 2019 at New Life Freewill Baptist Church, Lancaster, S.C. Rev. Doug Pate will officiate. Burial will follow in the Lancaster Memorial Park. The family will receive friends, Thursday, April 11, one hour prior to the service beginning at 10:00 o’clock a.m.
Joli passed away suddenly, Sunday, April 7. Born in Lancaster, she was a daughter of Nancy Hensley and the late Gerald "Slick" Hensley. She was a supervisor over quality control. Joli enjoyed painting, dancing, taking trips, crafts, laying out in the sun and being close to the water. Surviving in addition to her mother are her husband, Michael McMullen; 6 children, Raquel Brown, April Stevens, Heather Stevens, Sergio Brown, Briauna Williams and Mikekevious Williams; 14 grandchildren and 4 sisters, Vicki Radabaugh, Terressa (Doug) Starnes, Donna Barrett and Sharon (Kerry) Smith. In addition to her father she was preceded in death by a son, Maquel McMullen. Baker Funeral Home, Kershaw is serving the family. To plant a tree in memory of Joli Lynn Hensley-McMullen, please visit our Tribute Store. "Email Address" would like to share the life celebration of Joli Lynn Hensley-McMullen. Click on the "link" to go to share a favorite memory or leave a condolence message for the family.